Singer, songwriter, producer and multi-instrumentalist Enrique Infante will be relocating to the Houston area and Natalie’s Coal Fired Pizza and Live Music will celebrate his last show in Columbus on August 14th starting at 9pm. His band “Dejavu Latin Fusion” has been a regular Latin Fusion tidal wave of music for the past several years here in the Columbus area. He formed Dejavu in 2004, a Latin Fusion Rhythms band which whom recorded his first album “Abriendo Caminos” (“Opening Paths”) in 2006 in Lima Perú. That CD was released at the Columbus Music Hall on November 11th of the same year. 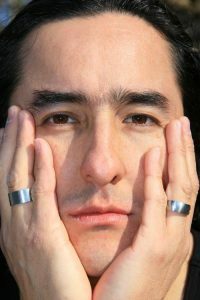 Enrique Infante was born in Lima Perú in April 23, 1972. He co-wrote the music for a Children’s theater Play “The Tree of the lost Orchard” on 1995 and a year later he went in a tour to Europe with Los Mojarras; a famous Peruvian fusion band that recorded the soundtrack for a movie “Anda corre y vuela” (“Go, Run, Fly”) that won a first prize for a Third World Countries Film Festival in 1996 in Germany. Infante was recently announced as a winner artist of the ‘200Columbus in Song’ contest with the song ‘Colors of Columbus’ in collaboration with Kimberly Hollingsworth and Danny Aguiar. His second studio album “Canciones Ajenas” was released on May 5th, 2012.